Every other year since 1964, Chemical Processing has bestowed Vaaler Awards on products and services that can significantly improve plant operations and economics. This year's Chem Show provided a fitting venue to honor recipients of two of Chemical Processing's biennial Vaaler Awards. Mark Rosenzweig, the magazine's Editor in Chief, presented one of the coveted awards to Mike Curnutte of L. J. Star Inc. for its LED Ex Luminaire Series 55-EX, and another to Phil Mahoney and Chris Walker of A. W. Chesterton Co. for its 1622 Low Emissions Valve Packing. The L.J. Star Lumiglas Series 55-EX is the first high-power LED sight-glass luminaire suitable for illuminating the interior of a process vessel in a hazardous area. The compact impact- and vibration-resistant luminaire produces light without heat and boasts an operating life of about 50,000 hours. So, it can be used in heat-sensitive processes and harsh environments and in applications demanding exceptional reliability and low maintenance. The luminaire gives light comparable to a 45-W halogen bulb but only uses 9 W of energy and lasts about 50 times longer than a halogen. In addition, it emits a directional light source similar to daylight that provides greater ground definition and less eye fatigue than halogens. The luminaire has a stainless steel housing and is designed for universal application in potentially explosive environments (ATEX gas zones 1 and 2, and dust zones 21 and 22). It can be used to illuminate the interior of tanks, hoppers, silos, agitators and other normally closed vessels and reactors as well as visual flow indicators, pipelines and bioreactors. 1622 Low Emissions Valve packing is designed to minimize emissions of hydrocarbons, volatile organic compounds and hazardous air pollutants, steam and most oxidizing chemicals from block valves. Independent tests showed the packing had an average emissions rate of 12 ppm, exceeding current requirements for the chemical, petrochemical and refining industries. The simple-to-install single-spool braided packing can match the performance of two-spool systems and more-expensive die-formed packing sets. Its flexible, metal-reinforced-graphite design can cope with temperatures as high as 1,200°F and pressures up to 3,800 psig. The packing is non-hardening, won't shrink or absorb moisture, and contains passive corrosion inhibitors. The packing fits a wide range of block valves and can handle any valve sealing applications where graphite stem packing is suitable. So, standardizing on it can cut packing inventory, reduce chances of error in packing selection and simplify installation. Plants can use 1622 packing to comply with U.S. Environmental Protection Agency consent degrees requiring "low leak valve packing technology" to remedy non-complying valves. Every other year since 1964, Chemical Processing has bestowed Vaaler Awards on products and services that can significantly improve plant operations and economics. To be eligible for one of this year's awards, a product or service must have been commercialized the United States between May 2009 and June 2011. Chemical Processing's Editorial Board, which consists of technical professionals with diverse responsibilities and from a variety of industry sectors assessed 14 entries for technical significance, novelty or uniqueness, and breadth of applicability. This impartial group didn't have to bestow any awards but decided to recognize four products. Besides the ones from L. J. Star and A. W. Chesterton, the judges selected the Rosemount 3051S electronic remote sensor (ERS) system and ValveLink Mobile from Emerson Process Management. 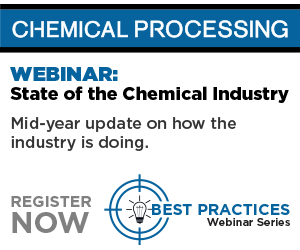 More information on the winners will appear in December's Chemical Processing.